In its 15th year, the Molokai-2-Oahu Paddleboard World Championship (M2O) will host its largest field of international competitors, featuring the sport’s most elite athletes, including two-time champion Jenny Kalmbach of Kona. On Sunday, July 31, an armada of more than 250 athletes on both prone and stand-up paddleboards (SUP) will attempt the 32-mile, open-ocean crossing of the infamous Kaiwi Channel, also known as the Molokai Channel. Australia’s effort to continue national dominance over the men’s solo prone paddleboard division is led by 34-year-old Jamie Mitchell who is seeking his tenth consecutive win. In 2007, Mitchell recorded the fastest ever Molokai crossing in a time of 4 hours, 48 minutes, 23 seconds. Mitchell’s closest competition in the past 10 years has come from Brian Rocheleau. The 35-year-old Hawaiian has finished second to Jamie three times and in the top five in each of his solo crossings. Rocheleau would like nothing more than to break the Australian sweep seen at the 2010 race and return the title to the islands. Australians Joel Mason, 29, and Jackson English, 36, are also vying for the top spot. A host of talented newcomers to the M2O championship are expected to push the pace on Sunday. Two notable lifeguards are looking to add the sport’s most prestigious title to their collection of paddleboard victories. Australian Wes Berg, 31, was reported to have fired a warning shot over the bow of the 2011 M2O championship after he staged an impressive win at an open-ocean warm-up race in Mitchell’s hometown of Currumbin. Los Angeles County Lifeguard, Anthony Vela is also in this year’s mix. The 36-year-old Redondo Beach resident is coming off a recent win in June at the Jay Moriarty Memorial Paddleboard race in Santa Cruz, California. In his first 32-mile race at the Catalina Classic, Vela finished third. On the women’s side, Kauai resident and eight-time M2O champion, Kanesa Duncan, made her entry to the race’s hall of fame in 2004, setting the current women’s record time on a stock paddleboard (5:53:49). 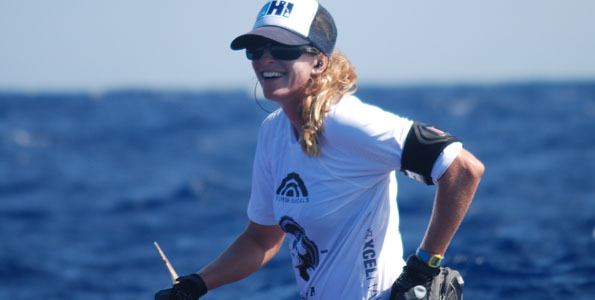 Her record setting victory is proof that the power of the athlete, favorable water conditions and strong navigation skills can sometimes win the day on a stock board, rather than on a longer and more streamlined unlimited board. Duncan, a 35-year-old professor of Marine Biology at the University of Hawaii, has been paddling in the unlimited class for the past eight years. Making the switch from SUP to the prone division is Candice Appleby. Originally from San Clemente and now living in Honolulu, the 25-year-old has dominated the SUP race scene over the past few summers. Appleby hopes to transfer her SUP skills to a successful challenge in a division that has been dominated by her fellow waterwoman, Duncan, for nearly a decade. The paddling world will be watching a rising star from the Sunshine Coast of Australia. Buderim, Queensland native Jordan Mercer, at the age of 18, is the youngest solo prone paddler in history to compete at the M2O World Championship. Mercer is following in the footsteps of her father, Dean, and uncle, Darren, whose names are legendary in Australian professional lifeguard competition. The ancient Polynesian mode of transportation, stand-up paddleboarding, now more commonly referred to as SUP, is making a modern resurgence. At M2O this year, 52 solo racers will compete on stock and unlimited boards. One of the sport’s most active supporters and 2010 M2O champion, Dave Kalama, 46, is a favorite in this year’s SUP division. Last year, the world-renowned waterman and big wave surfer from Maui set a SUP course record time of 4:54:15, just two minutes behind his prone paddleboard counterpart, Mitchell. Seeming evenly matched, bragging rights may be up for grabs between the two friends. Connor Baxter, also from the island of Maui, is back after a fourth place finish in 2010 (5:12:43) and hoping to chase down Kalama. Recently, the 17-year-old Baxter exchanged leads with Kalama in a race over the Pailolo Channel, connecting Maui and Molokai. Baxter prevailed in this meeting, demonstrating that he is one year older, one year stronger and a serious contender for the M2O World Championship. Scott Gamble, 35, from Honolulu is also returning and looking to better last year’s performance. Gamble was in contention for second place in 2010 before he made a miscalculation in the last few miles, tripping up on an inside wave and landing in third place (5:06:15). The popularity of SUP is evident in the women’s race with a record field of more than 10 solo competitors led by returning champion Andrea Moller. Born on the island of Ilhabela, Brazil, Moller, 32, moved to Maui in 1998. Her 2010 win at the M2O World Championship was a women’s record at 6:00:00. The 2009 M2O women’s champion (6:18:31), Jenny Kalmbach, returns for her third time. Born in Costa Rica, and now living on Kona, Kalmbach, 28, has risen quickly in a short career, building an impressive list of victories. The 2011 stock class at M2O boasts two notable athletes from Honolulu. Erik Abbott and Andrew Logreco lead the field in their respective divisions of prone (Abbott) and SUP (Logrecco). Both will likely win their class and stand a strong chance of beating some of their unlimited counterparts to finish in the top 10 overall. Behind the field of solo paddlers will be 75 teams in both the prone and SUP divisions, featuring the father-son duo of Aaron and Riggs Napoleon in the SUP division. The Napoleon’s are a famous Hawaiian waterman family. Last year Riggs was the youngest ever solo competitor to cross the channel at age 12. Former Ironman Triathlon World Champion, Greg Welch, is making his return to endurance competition on a team with fellow triathlete Roch Frey and powerhouse paddler Chuck Glynn. The Molokai-2-Oahu Paddleboard World Championships, presented by Kona Brewing Co. is recognized as one of the world’s most challenging tests for endurance and courage. Covering 32 miles of open-ocean, more than 250 competitors will cross the Kaiwi Channel, from the North Shore of Molokai to the South Shore of Oahu, under their own power on prone paddleboards or stand-up paddleboards (SUP). The fastest athletes complete the crossing in just under five hours, facing treacherous currents, powerful swells and a depth of nearly one kilometer. Paddlers can ride swells for 100s of yards. Competitors can choose to race as a solo paddler or as part of a team in either the unlimited class (no size limit and with a movable rudder system) or stock class (12 feet or under for paddleboard, 14 foot or under in SUP with fixed rudder). The organizers and athletes of the Molokai-2-Oahu Paddleboard World Championship thank the partners for making the annual race possible. Partners include (alphabetically): Dukes, Garmin, Hotel Renew, Kona Brewing Co., Maui Jim, Patagonia, Rogue, Sambazon, Scott Hawaii, Standup Paddle Magazine, Wahoos and Waterman’s Sunscreen.